*If paying by Credit include expiration date, name as it appears on the card, and billing address as it appears on the statement. 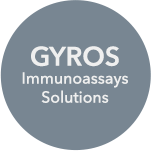 Gyros Protein Technologies accepts Visa, MasterCard and American Express. $100 minimum order for US and Canada customers. $200 minimum order for international customers. Net 30 days (for established accounts). Shipping is FOB Tucson, AZ. Freight charges are prepaid and added to the invoice. Non-hazardous products: Collect shipments of these products are made by FedEx or UPS. Hazardous products (e.g. Dichloromethane products S-4x4L-DCM and S-4L-DCM): These products are shipped by truck (R&L Carriers). Returns are accepted with prior authorization only. Contact PTI Customer Service (800-477-6834 FREE) for return instructions. For customers outside the US or Canada, please contact your local distributor for ordering information. Copyright © 2018 Gyros Protein Technologies AB All Rights Reserved.